Emelie Forsberg was born in Sweden, is a member of Salomon team and has won numerous mountain races in Europe and in the US. 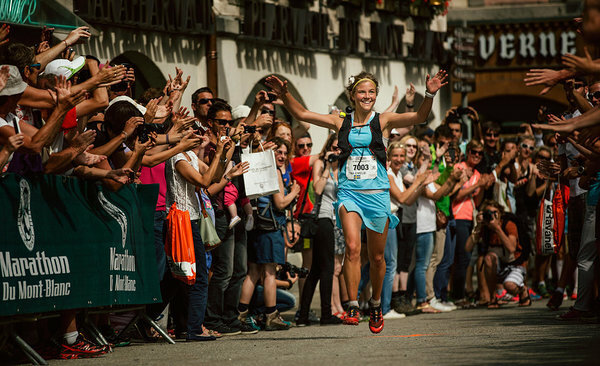 In addition to race victories she has been crowned as the overall winner of the Skyrunning series and has showed top results also on ski-mountaineering. To see all her results, head over to Wikipedia! Before we get to Emelie let’s look at the psychological background of an injury. Imagine this - you are in the best shape of your life, you are physically strong, you are mentally on top of your game, performing at your highest level, the future is looking awesome and suddenly out of nowhere (the injury doesn’t schedule itself you know) you get injured. End of the world, right? Yes. Maybe. Not really. No. Sports injuries have both physical and psychological challenges. Injured athletes WILL experience very wide range of intense emotions such as anxiety, stress, frustration, lack of confidence and depression. And ... that is all perfectly normal. Negative thoughts, feelings and emotions are perfectly normal reaction to the situation. The reason for having those negative thoughts, feelings and emotions is simple- as an athlete sports is a sense of identity for you, you are seeing yourself in terms of sports. When it is temporary or even worse, permanently taken away, you will loose a big piece of who you are. It is also a big source of self-esteem for you, providing continuous positive reinforcement and outside recognition by friends, family and even through social media by people you don’t know in person. But.. Your response to injury is the biggest key factor that determines how efficiently you will return to action! I’m not saying that you can’t have anything negative, far from that. EXPECT those negative thoughts, feelings and emotions to creep up and disturb you, but also learn mental skills to accept and defuse them, to observe them and to take action. psychological readiness to return to action. Positive attitude when returning to action - “I really want to play again” vs negative - “I hope I won’t get injured again”. Denial - after the initial shock many athletes are trying to play down the significance of injury or are not allowing themselves to think about it. Anger - as the injury becomes more obvious, shock is replaced by anger, directed towards themselves or towards other people. Here the response can vary, but is likely to be especially strong in athletes who see themselves through sports, because they have just lost a big part of their identity. Bargaining / rationalizing - the athlete is looking to avoid the reality. Training extra hard to make even lost training days falls definitely into this stage. Depression - reality. Realizing the consequences of the injury, especially of one where the recovery time is uncertain (concussion for example). Depression is perhaps not the right word here, as it is not always inevitable and has not always been observed during the grief reaction in research studies. Acceptance and reorganization - accepting the injury and directing the attention towards rehabilitation and return to action. The athlete is able to accept and defuse negative thoughts, feelings and emotions and sets goals to overcome injury as they know now what needs to be done for an efficient recovery. Uncertainty is is one of the major triggers of anxiety, so it is best to know your injury and the rehabilitation process as good as you can. Become friends with your injury! Now that you have an overview of how the mechanism of being injured actually works, let's see how Emelie is dealing with her injury, what kind of mental strategies she is using to deal with the low's and where she finds support. See if there are similarities between the theoretical framework and her personal experience! To set the stage, please reflect back what happened and how you got injured. It's pretty easy to remember that! It was on the 5th of February (2016) and it was the first race of the ski mountaineering European Championships. I was in my best shape ever, I've been training hard, got some good results from the ski mountaineering World Cup and was overall really happy with my shape and feelings. I was leading the World Cup and was super excited to fight for the victory at the European Championships also. I started the race and was in the lead. Already on the first uphill I started to feel heaviness in my legs which was a bit strange, because normally it doesn't happen. There was a lot of snow that day and I didn't find a super-good line. On the way out to the transition point the third woman caught me. It always gets really crowded at that point and as she was passing me, she touched my ski and I just fell to the side of the track. First of all it was hard to get up, because there was really a lot of snow. When I finally got up I felt that something is not good in my knee. I've never, pepper-pepper, been injured in my whole life, so I didn't know what it was, but I realized it was not good. So I just went to the transition point and started to put on the skins again to prepare for the next uphill, all the while thinking: “what shall I do?”, “what is this?”. I tried to continue, but felt directly that I couldn't continue, so I stopped. I was taken to the race doctor and he did the first examination. It is really hard to see if it's an ACL (anterior cruciate ligament) injury and so he said that it is probably not torn. Emotionally I didn't feel almost nothing at all, I was just there in that moment and was trying to understand what had just happened. As I mentioned, having never been injured before, I didn't know what it was. After the race was finished, the race doctor took me immediately to the MRI and also the other doctor there told me that the knee is too stable and not swollen, so the ACL is probably not ruptured. But later on the MRI test showed that it was almost a full rupture. That was really hard, because there was also a third doctor who tested my knee and said that it is not a rupture. I started to get my hopes up already, because I had no pain, it was not swollen, so I was thinking already that it is really nothing! What were your thoughts, feelings and emotions at that point? At that point I still didn't want to get my hopes too high up, I didn't want to think anything before the results from the MRI were there. But for sure, I got a bit more relaxed when the three doctors said that probably it is not a rupture and I was already secretly thinking, that I'll be back for the next race. There was really a hope there and even though I didn't really want to get my hopes up, I still did. Were there more emotions at that moment or were you more thinking in pragmatic terms that you can't race that season anymore? I think neither of them. Because for me it's not only about racing. For sure, I was in a good shape, but I was sad to have that big injury because I really love just to be outside every day and to train. That's what I love to do the most. It was more the knowledge that I had lost the ability to do that for many weeks and months. You have been much more open about your injury than most of the athletes and sharing a lot of the negative aspects of the injury. I think there is nothing to hide, really. Luckily my boyfriend came the next day and the whole Swedish team was there with me in the hospital. I was really-really-really sad for an hour, I was absolutely devastated. But then I tried to get my act together, because injuries are part of sport, right? Already from that moment on I knew what I had to do with my injury, what I needed to do for the rehabilitation, so I had everything under control. For sure, during some moments I got really sad, but then I took a step back to evaluate myself and the situation and decided that this sadness needs to wait a bit until I'm home. I wanted to appreciate the time with my boyfriend and the team and analyze the situation more in-depth when I'm at home. I had a bit of a meltdown on Sunday morning, so two days after the injury when I was supposed to go home by train, but I couldn’t. Luckily my boyfriend was still there and he drove me home and that really helped a lot to have him around. This second day after the injury was definitely emotionally the worst day. Everything came at once - including all the different paperwork with insurance for example, even though I told myself that I won't focus on that and let the ski-mo federation handle it. As an athlete I'm really lucky that I can allow myself to do that and to have them covering my back! And then I allowed myself to be really sad. But at the same time I had distance to the sadness, I knew that I needed to let myself to feel this way for a while, but I also knew that I could overcome the sadness and look at the bright side when I wanted. Knowing how to do that switch was really interesting. And now thinking about it, I always maintained a distance to the positive and the negative thoughts so that I wouldn't be completely overwhelmed by them. That is actually a very good ability to have and to cultivate. Distancing yourself from your thoughts, feelings and emotions and observing them so that you wouldn't be overwhelmed by them. Yes! I was thinking about that ability when we were in contact before. It almost felt unreal that I could switch in such a situation from feeling sad to feeling positive again so fast. But at the same time does the ability to switch so fast between the opposites means that I don't care about anything or that being injured means so little to me? I started to think in that direction too! Even today I have no answer to this, why and how I react the way I do. But I think it was important for me to be really sad, I'm sad even now because I miss so much being out in the mountains. I think the acceptance part is really important, you need to be true to yourself and accept whatever is there. Instantly when I saw the MRI I thought “right, I'm injured, I just need to figure out what to do now and find the positive things in this situation.” I didn't choose to become injured and knew that life can be good also while being injured. Looking at your reaction to the injury it seems that you almost skipped the denial, anger, rationalizing and depression parts and were in the acceptance phase right away? I think for me that is a very natural thing to do, that's who I am. As an athlete you always analyze what is going on in your body, what is this, why this feels like that and so forth. I'm very much the type that observes myself and is taking all those small manifestations seriously, because I want to be outside and don't want anything happening to me that would stop me from being outside. I want to have a healthy and a strong body! So the acceptance was a really natural state to me. What kind of mental coping strategies are you using? First, I think it is important to to have a plan, because uncertainty is not good. I got a date for my operation really quickly, it happened less than two weeks after the injury. To me structure is also really important, so I tried to structure everything I could before the operation - to build strength in my knee, to reduce the swelling and maintain the range of motion. I actually got really strong again and if I didn't choose to make the operation I would have been able to run again in no time, but I knew that I had to do the operation. I had a plan for that, but I was still left with a lot of time every day. Luckily I had many friends visiting me and that structured my days and distracted my mind from the injury. And that was really good! After the operation I didn't set any goals for the first two weeks because people are different and what takes someone one or two weeks might take me more. So I gave myself some extra time. When those two weeks were over I decided to start studying and to learn more about human physiology. That's actually something that I've been wanting to do for long and it felt like a good time to do it. I start every day with thought that this is going to be an exciting day! And most of the days following the operation really were bright, I did my rehab and I studied a lot. But then there were some mornings when those dark thoughts just were there and I had difficulties turning them around, I didn't want to do my rehab or to study. I thought that I just make a fire, look at a stupid TV series all day long, do nothing and not even answer phone calls. Actually some days I did that, but I'm not sure if that helped. Looking out from the window didn't help either, because I was confined inside. I had almost these childish thought where I was saying to myself that I don't want to do any of this and I just want to go to bed. But I also knew that once I start doing the rehab and studying or going for a walk, those thoughts would eventually subside and I would enjoy my day again. It wasn't actually that the whole day was dark, it was more like there were periods of maybe six hours when it wasn't that bright. The best things were those small moments during the dark days that would turn everything around. For example one day I saw the very first flower blooming and that instantly changed everything! I probably don't have to ask what is the hardest thing about being injured, but I will do it anyway. The mountains and being out there are the biggest part of my life, so losing that for a while has been hard. At the same time I know that this is something that I have chosen and there is so much more in life than those mountains. So that's why sometimes I find it hard to also define myself through sports, knowing what else is out there. Is there anything good you got out from being injured? (A loud sigh) It still hurts a bit in my heart when I think about it like that, because this is not what I want. The injury itself is definitely not good, but looking at it again from the brighter side I have had much more time to do some things I have been neglecting a bit. I have been studying much more, signing up to another course, taking care of the paperwork of my company. That has really kept me structured! And the best thing is that I've been talking to my friends much more, I've enjoyed having them around and being more flexible in my schedule! So there is a positive side also to being injured! Let's talk about social support. Friends, professionals and also people you don't personally know, but who are wishing you well through social media. I got lots of support from different people. I know many good doctors and physiotherapists and everyone has been reaching out to me, so I feel really secure and know that I'm in good hands and that for me is really important. I have an excellent physiotherapist here in Norway and I feel really secure with her. Of course my friends and my family were always there for me because for the first two weeks I was almost immobile. My mother and my boyfriend were both here not just to help with everyday things, but to keep the mood up and to have a good time. I had so many calls, e-mails and messages from my friends and also from my sponsors. And that also felt really good because it assured me that they are with me even when things are not going well. And then the social media! Being a professional athlete I got so much feedback from so many people that I couldn't answer to all of them, but 3000 people wishing you well must mean something. There is also another side to this. Sometimes I feel that I don't want to show that I too am a human, I only want to show that I'm the fastest woman out there coming down that mountain. I was dealing with that a bit, but then I decided that I post things as they are, I have always done that. I don't use social media to get feelings, but nevertheless I am really touched when I read those comments. Is there something really specific that has helped you to recover emotionally from your injury? As humans I think we need to feel that we are doing something that is important for yourself and others. So I've tried to keep myself busy with different projects. Take the studying for example. I feel that I could be useful to people in the future with my knowledge and experience, that's why I study. I have also been busy doing a project with Salomon, that maybe doesn't mean that much to people right now but soon it will reach them one way or another. Having a value and meaning in the things I do is important! Is there anything you would do differently when, let's say in 100 years you would get injured again? I think an injury is like traveling, you just need to get adjusted to the moment. I think I have done really well with my injury so far and in a big picture I wouldn't do anything differently. You do a lot of yoga. How do you benefit from that? Yoga is my way of meditation. I'm not very good at staying still and focusing, so yoga is really good for me, it helps me to relax my mind. It also helps me to be present in the moment and that helps me to be true to myself and stay grounded! There is always this last question - what advice would you give to somebody who is injured and is struggling with it? There is a slight difference between being a professional athlete or not in some ways, but on the other hand it doesn't really matter that much, an injury is still an injury. If you love training or running and that is taken away from you, it is really hard no matter if you are a professional or not. Just allow yourself to be sad for awhile, that is okay. But remember that there is so much more in life that can make you happy, not just training or running. That advice concluded the official part of our interview. Emelie talked a bit more how she is really looking forward to running just one minute in couple of weeks from now and how her garden will look in the summer. Huge thanks for Emelie for finding time to talk and also thank you for reading the interview! You can find her on Facebook - facebook.com/tina.emelie, Instagram - @tinaemelie, her website - emelieforsberg.com or in the mountains! PS! The next interviews will focus on motivation and mental toughness, functioning in an environment without the option to turn back and they'll have lots of snow and couple of bicycles in them also! So stay tuned! All pictures are used with permission. The header picture is taken by the very talented Jordi Saragossa, do check him out!